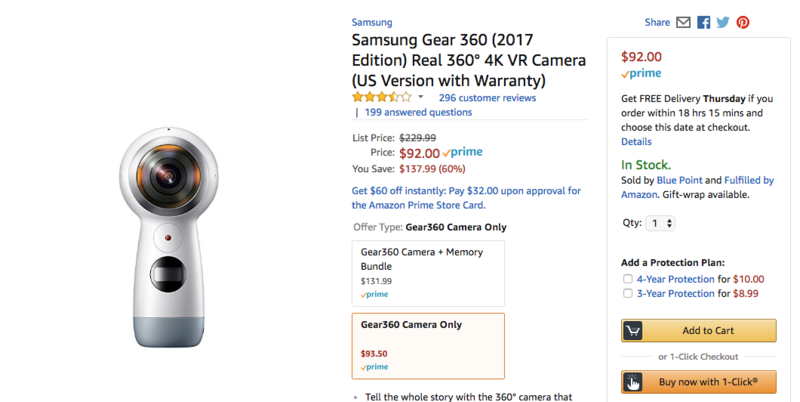 The Samsung Gear 360 started dropping in price just a month after it became available, and that trend hasn't stopped since. For Prime Day, it's dropped all the way to $92, which is the all-time lowest price we've seen by over $20. $92 for this thing is a fantastic price. It comes with its own handle instead of a tripod base. Two 8.4MP CMOS fisheye lenses work together to create 15MP photos and 4K videos at 24fps. IP53 water resistance is on board as well. It can be used with PC software, but you'll probably want a Samsung phone to use it with. We don't expect this $92 offer to last long, so jump on it quickly if you're interested via the source link below.